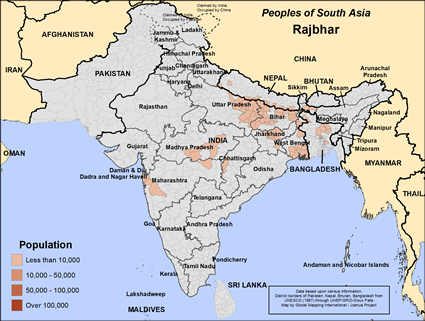 The Rajbhar people are among the original peoples in South Asia. Some would regard them as “scheduled castes” while others believe they are “other backward castes.” In either case, they have low status in Hindu society. Most of the Rajbhar people live scattered throughout India’s eastern states, but a smaller number live either in Bangladesh or Nepal. One report says they also have a large community in India’s state of Uttar Pradesh. Agriculture is their main work. Many of them work for other people, especially Muslims. The more fortunate ones among them are shop owners. They are not vegetarians, but rice is their staple food. The only meat they will not eat is beef because of their Hindu beliefs. Like other peoples in South Asia they have birth and marriage rituals, and they cremate their dead. On the death of the father, sons inherit the property. They do not use family planning. They do not condemn sexual immorality. Marriages are usually monogamous, unless the first wife approves him taking a second wife. When a spouse dies, the widowed is allowed to remarry. They have a community council to look after their needs and to settle their disputes. Almost all are Hindu. Traditionally they were especially devoted to the Hindu god Shiva. Today they worship many Hindu gods and participate in festivals like Holi and Diwali. They fear evil spirits so much that some will sacrifice a pig to protect themselves from harm. The Rajbhar people need to have the chance to live life to the full through a relationship with Jesus Christ (Jn 10:10). * Pray for a "Book of Acts" type of movement to Christ among the Rajbhar people. * Pray for the Rajbhar people to understand and embrace that Jesus wants to bless their families and neighborhoods. * Pray for Holy Spirit anointed believers from the Rajbhar people to change their society from within. * Pray for a movement of Jesus to heal and strengthen Rajbhar communities in India and Bangladesh. 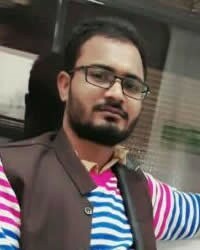 https://peoplegroupsindia.com/profiles/bhar/View Rajbhar in all countries.